This review is extraordinarily long because I wrote it for a class a few semesters ago where the assignment was to write a 1000 word review of a small press book:There are few things less tedious than having to listen to a friend recount a dream they thought was particularly interesting. It is boring. There is a flatness to the retelling. Weird event follows weird event and time seems to slow down while the narrative never goes anywhere. While the work of Shane Jones is strongly related to dreaming, it is never boring. Instead, it is exciting. He may write about men with axe noses and polite sea monsters and tiny sheriffs living in stomachs, but his narratives never embrace dreaming in their entirety. Unlike an account of a dream, Jones’ writing is carefully constructed with an emphasis on feelings such as helplessness and yearning that underlie the unreal situations that he described. Instead of existing in dreams, his writing seems to exist in realities that are different from our own. They ignore the laws of physics and follow other laws; where people, objects, and places transform and inexplicably shift in size.In 2009, the small press, Publishing Genius, published Jones’ debut novel, Light Boxes. The following year, it was reprinted by Penguin Books. The novel concerns a town of balloonists and their war with February, a man who refuses to allow the month of which he shares a name to end. Its unreal elements are less prominent than in Jones’ other work and the story resembles Richard Brautigan’s more fantastical work.His new poetry collection, A Cake Appeared, embraces the possibilities of the unreal to its fullest capacity. The majority of the poems are no longer than a page. They vary between prose poems and free verse, and everything is story/narrative-based. The long poem, “The Nightmare Filled You with Scary,” is the highlight of the book, but it does not feel like it is a good fit. Its darker tone contrasts with the other poems which, unlike “Scary,” share connections. For example, in “Attics,” birds build an attic on top of a man’s attic, and he charges townsfolk to look at it as they have ‘an emotion of their choosing,’ while a woman in “Her Chimney Tells Me She is Sad” builds a chimney around herself because she ‘wanted to feel something,’ then in “Half Scary,” a man in a town is building another chimney around himself: ‘When the evening sets / it’s so quiet / except for the scrapping / of mortar on the bricks. / The chimney sits around his waist.’Characters from one poem will stumble into another. In “Bob,” a scarecrow chases a character named Bob On A Bicycle into a river, where he is eaten by an alligator. On the next page, the title character in “A So Sad Big Man” sits in a bathtub. A man on a bicycle rides into the bathroom and starts ‘riding in circles around the so sad big man in the bathtub’….”Feeling any better?” he asks. “A little,” said the so sad man breaking a smile.’“The Nightmare Filled You with Scary” concerns a town whose dreams are haunted by a man named Avery. There is an echo of Light Boxes here, where every person in a town shares a common antagonist, although the poem focuses on a married couple and their baby. Each line consists of about four words, giving the poem a claustrophobic-feel. It is never made clear what is so terrifying about Avery. He may kill the townspeople with his shotgun, but they are willing to commit suicide in their dreams to wake themselves up so they can avoid a confrontation with him. They surround their sleeping bodies with gun and knives, because assumingly, they can only acquire these weapons in their nightmares if they take this precaution prior to bedtime. The animals in the town also fear Avery and commit suicide to avoid him. The married couple of the poem recently had a baby, who understandably has sleeping problems. They try to teach him to commit suicide, but do not succeed. Due to this, the baby is likely to be more psychologically damaged when he gets older than everyone else in the town. Eventually, the problem is partially solved when the couple and the baby join a motorcycle gang.One of the joys of reading the poems in A Cake Appeared involves the transformation of people or objects. In “Poem That Is 20-25 Lines Long Including Line Breaks,” the protagonist watches as ‘one bear steps on the squirrels and pushes the other bear through a glass window and (he) run(s) over to watch the bear falling but the bear is now a car bouncing and rolling down the cliff and when it reaches the bottom it hesitates, rocks from side to side for a moment, before exploding.’ Jones leaves it up to the reader to determine the meaning behind this transformation. His work may be simplistic on its surface level, but he leaves what lurks below open to interpretation. The surface provides an inviting entry point into his poetry while its depths are responsible for its greatness.Morgan Blair’s wonderful cover art is worthy of a mention, featuring a bearded man and his elaborately designed shirt (or sweater). The man, whose face is not shown above his lips, is reflected in the book’s content, bringing to mind the characters that reappear throughout the poems. Men with beards are very prominent in the book, and their facial hair often serves as a major component to the stories, such as in “Hello Woman in the Woods,” where a man with a beard finds a woman knitting a sweater. When finished, she gives it to him. ‘The sweater was orange (like on the cover) and on the front was stitched a picture of him without a beard. 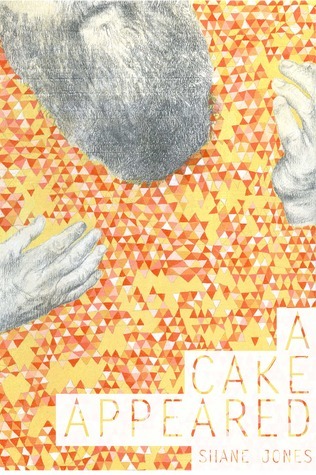 After he put the sweater on his beard fell off and onto the stitched picture on the sweater.’Shane Jones’ A CAKE APPEARED is proof that the use of minimalist language can result in something magical. It is a feast for the imagination and the senses. When I'm left with an empty house for more than 24 hours, something strange happens. I clean. I pour myself a stiff drink. And suddenly - like magic - a cake appears in my oven, and I am alerted to its arrival by a sweetly obnoxious buzzing of the sinuses.The same strange something happens to Shane Jones, I now know, only minus the alcoholic housewifery.A Cake Appeared, which too mysteriously appeared in my oven, explores the nature and function of folktale in a postmodern world - that is to say one without the necessity of the origin. Where appearance is part and parcel of reality. Things happen - or don't happen - in brief episodes of pure creative bliss. And somehow, like magic, it works.It works because Shane Jones says that it will. And Shane Jones is somehow channeling (through an oven, no doubt) the spirit of William Blake's Songs of Innocence and Experience, which makes each of his poems if not out and out terrifying, then certainly Scary dressed up as adorable good fun. The boyish double-spacing, with the aesthetic sophistication of a handwriting primer, smartly taunts the reader with the present possibility of absence -- just what is each poem not saying? -- and the poignant suggestion of flaw in the seemingly harmless bedtime stories that shape us.There is, a la Blake, a noticeable shift in the pillowing narratives offered on the sly through the guise of rollicking poetry. (See Innocence:I broughtmy pet dinosaur to the zoo once and introduced him to the gorillas. Iheard him whisper this is my pet human and when I turned from thegorilla cages I saw all the people in the zoo were ash colored. )(See Experience:I promise to myself each year that I will set the trees on fire. I haveimagined what burning trees would like like through the blue stainedkitchen windows. I can see the leaves as ghosts burning and flying andcurling through the air. And each year I find myself in bed like all the restof you, small and sweater clad. )This split is walled off by the long-stand-alone-(available-from-Cannibal-Books)-poem The Nightmare Filled You With Scary, which is heart-wrenchingly sad and laughably clever all at once (another mystery). Before TNFYWC, the appearances are restricted to cakes:Happy birthday, said the artist. Everyone forgot about the dead bird. Thefiddlers danced in front of the fireplace. A cake appeared.Post TNFYWC, the appearances are less delicous:I walked into the bedroom and a cage was on the bed. Not a small cage,like a bird cage, but a big cage, like a gorilla cage. I yelled for you and youcame running into the bedroom holding a pint of blueberries. "Where didyou get that?" you said. I walked around the bed, inspecting the cage. "Ididn't get it," I said. "It just appeared. "Need I bring up the Blake allusions yet again?All in all, A Cake Appeared is a tasty treat, doused with a bit of the uncanny and baked with love at 9000 degrees of stifling truth. Buy it, really. Or else Shane Jones and I will eat you with our Sunday tea. From publisher (3.5 stars - strongly recommended for readers familiar with genre)Now this is how you write unconventional short stories!Shane Jones blew me away with his novel Light Boxes, in which the month of February refused to release the townspeople from it's cold clutches.In A Cake Appeared, - a collection of poems, fables, and scrolls - we get a larger sample of the type of writing Shane is capable of.Twisted and dark, silly and strange, we discover the man with the ax for a nose, the nightmares that cause townfolk to kill themselves, a man and woman who build chimneys around themselves.... it's all so bizarre, and yet, at the same time, quite believable.Here is a sample of what this collection contains:"I promise to myself each year that I will set the trees on fire. I have imagines what burning trees would look like through the blue stained kitchen windows. I can see the leaves as ghosts burning and flying and curling through the air. And each year I find myself in bed like all the rest of you, small and sweater clad." - pg.72This collection is perfect for readers who like their short stories with a splash of imagination! I think I went from really liking Shane Jones' books to being a fan of his work with this book. Colorful and original imagination; sometimes naive, sometimes bold, but always unique. I do feel his writing may not be for everyone, and that's okay. All I got to say is it may take a little effort to find a copy of A Cake Appeared but in my opinion, it's well worth it. glad i got to read this. reminded me of timmy's book in a way. Shane Jones - Shane Jones (born February 22, 1980) is an American novelist, short story writer, essayist, and poet. He has published three novels, two books of poetry, and one novella.Shane Jones was born in Albany, New York. He graduated from SUNY Buffalo in 2004 with a B.A. in English. As of May 2015, Jones is represented by the literary agency Dunow, Carlson & Lerner. He was a student in Lydia Davis's fiction workshop taught at the NYS Writers Institute.